Studio Line: Warner Bros. - Do you know who your enemy is? When ruthless terrorists threaten to bring down the United Nations, they frame the one man they believe can stop them — an international security expert named Shaw. Now he must run from his own allies and become a solitary force for good, as he tries to stop what could become World War III. Box Office: Budget: $40 million. Opening Weekend: $10.41 million (2630 screens). Gross: $30.199 million. DVD: Widescreen 2.35:1/16x9; audio English Dolby Digital 5.1; subtitles English; closed-captioned; single sided - dual layered; 35 chapters; Rated R; 116 min. ; $24.95; street date 12/26/00. Supplements: Theatrical Trailers; Cast and Crew Filmographies. Remember back when Wesley Snipes was seen as a rising young talent, one who had some serious potential as a terrific actor? I sort of can recall those days, but as every year passes, these memories become more and more faint. This is due to an inglorious series of weak films in which Snipes has starred. Okay, I rather enjoyed 1998’s Blade, but that cool comic book adaptation won’t eradicate any concerns about his career trajectory. Nor will his most recent movie, The Art of War. While this action thriller provides some modest enjoyment, it remains a fairly pedestrian affair that does little to enhance the résumés of anyone involved. TAOW places Snipes in the role of Neil Shaw, an undercover agent who works for the United Nations. When a mission goes in an unexpected direction, Shaw’s framed for a murder he didn’t commit and he has to unravel the intrigue to clear his name and find the villains involved. Not exactly original, is it? In and of itself, that’s not a concern; after all, plenty of movies feature tired plots but still are entertaining pieces of work. To a degree, TAOW falls into that category, but the action never becomes scintillating or distinctive enough to overcome the worn-out story. Every aspect of TAOW seems respectable and competently executed. Director Christian Duguay doesn’t have a very impressive résumé - his best-known prior release was the TV movie Joan of Arc - but he proves himself reasonably up to this task. I thought the gratuitous use of the “bullet time” slow-motion photography made popular in The Matrix seemed lame, but Duguay imbues most of the film with a nice sense of style that made it visually-compelling. However, that’s really about all that was fairly positive about The Art Of War, and even the visual flair felt second-hand; we’ve already seen this movie, and I liked it better the first - and second, and third - time. It’s simply a very derivative and uninventive film. Does it do anything particularly wrong? No, the movie possesses no overt negatives other than its lack of inventiveness. While I didn’t strongly dislike The Art of War, I also found nothing to excite me. It’s a very mediocre action flick - nothing more, nothing less. 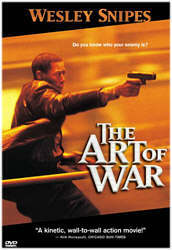 The Art of War appears in an aspect ratio of approximately 2.35:1 on this single-sided, double-layered DVD; the image has been enhanced for 16X9 televisions. I suppose the picture could look better, but I find that hard to imagine, as TAOW provided a virtually flawless image. Sharpness appeared absolutely immaculate at all times. Even during the widest shots, I didn’t discern a hint of softness or fuzziness. The picture stayed wonderfully crisp and detailed throughout the film. I witnessed no examples of moiré effects or jagged edges, and the artifacts from the anamorphic downconversion on my 4X3 TV seemed blissfully absent. Print flaws also presented no concerns. I saw no signs of grain, hairs, scratches, tears, grit, blotches, speckles or other defects; it’s a nicely clean image. Colors were tremendously solid, with hues that always seemed accurate and true. Some scenes came across especially well; the opening New Year’s Eve party presented a slew of eye-popping colors that almost jumped off the screen. Black levels seemed immensely deep and rich, and contrast was excellent. Shadow detail came across as clear and appropriately opaque without any signs of heaviness or thickness. I came extremely close to giving the image an “A+” - it’s a nearly-perfect picture. Also fantastic was the Dolby Digital 5.1 soundtrack of The Art of War. From the second this film began, the mix seemed immensely active and involving. All five channels provided a tremendous amount of information. The forward speakers dominate - which is natural, since the vast majority of the dialogue comes from the front - but the rears gave them a run for their money; the surrounds kicked in with so much audio that it nearly became overwhelming at times. The track offered a wonderfully engaging experience throughout the film. Audio quality also seemed excellent. Dialogue appeared crisp and natural with no signs of edginess or problems related to intelligibility; speech was always distinct and dubbed lines blended well with the rest of the track. Music seemed bright and rich and provided excellent bass, as did the effects. In this kind of film, effects are especially important, and the sound of TAOW doesn’t disappoint. They blast realistically and cleanly from all the speakers and provided a dynamic punch. As with the picture, the sound of The Art of War nearly earned an “A+” - it’s a terrific track. So far so great, right? Unfortunately, I now need to discuss the supplements, or the lack thereof. On this DVD, we get “Cast and Crew” listings for actors Snipes, Donald Sutherland, Anne Archer, and Michael Biehn plus director Christian Duguay; these are straight filmographies with no biographical information included. We also find a series of trailers for The Art of War and other movies from Morgan Creek; presented are ads for Battlefield Earth, Chill Factor, The In Crowd, Robin Hood: Prince of Thieves, The Whole Nine Yards, and Young Guns II. It’s a very lackluster bunch of extras. I suppose that’s fairly appropriate, since The Art of War is a fairly average film. It offers some decent thrills and excitement at times but almost nothing about the movie makes it stand out from the crowd. However, the DVD offers absolutely stunning picture and sound, though it skimps on supplements. For action fans, The Art of War might merit a rental.